Celebrations of Lunar New Year are infused with symbolism, and celebrants wishing to usher in a year filled with good fortune take great care preparing for the festivity. 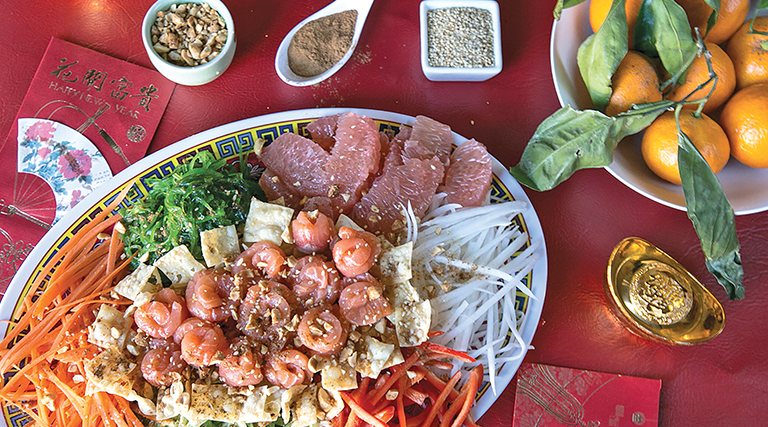 Yusheng is a popular Lunar New Year appetizer for Chinese living in Singapore and Malaysia. It symbolizes abundance, prosperity and good fortune. Each component of the dish represents these symbols. Raw fish represents its homophone, abundance. Other examples are the pomelo and lime together with raw fish for added luck, shredded radish for eternal youth and crushed peanuts are sprinkled over the dish to suggest a household filled with gold. Once the yusheng is assembled on the platter, family and friends gather around to perform a ceremony known as a Prosperity Toss, or lo hei. Everyone digs into the salad with their chopsticks and tosses the ingredients into the air while sharing wishes for a prosperous new year. Some say the higher the toss, the greater the fortunes. Most of the ingredients for this yusheng recipe can be found at large grocery stores and Asian markets. Check with the fishmonger that the salmon is safe to be consumed raw. Serves 6. In a small bowl or Mason jar, whisk together plum sauce, rice vinegar, sesame oil. Using julienne blade on a mandoline or a vegetable peeler with teeth rather than a flat blade, slice carrots, radish, and cucumbers into long, thin strips. Place each pile of vegetable strips around the edge of a platter. Continue placing the ginger, pomelo or grapefruit segments, crispy wonton skins or Pok Chui crackers, red pepper strips, and seaweed salad in piles around the edge of the platter. Cut the salmon into thin slices and roll each slice into rosettes. Place rosettes in the middle of the platter. In another small bowl, combine Chinese Five Spice and cinnamon. Place limes, chopped peanuts and sesame seeds into small serving bowls. Sprinkle sesame seeds, peanuts and spice mixture over salad. Pour dressing over salad. Combine all ingredients and serve with lime wedges.